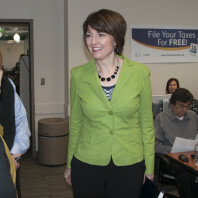 Congresswoman Cathy McMorris Rodgers visited our campus today for a handful of meetings. 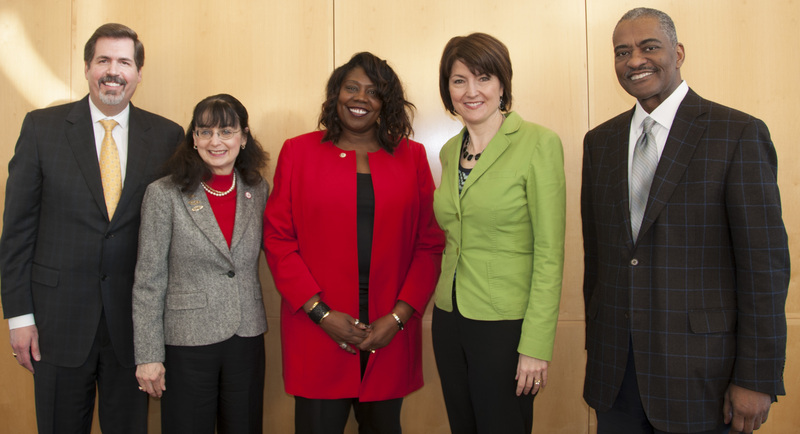 First, she met with the leaders of our area universities to discuss higher education issues at the federal level, pictured above with Gonzaga President Thayne McCulloh, Eastern Washington University President Mary Cullinan, Whitworth Chief of Staff Rhosetta Rhodes and WSU President Elson Floyd. Not pictured: Community Colleges of Spokane Chancellor Christine Johnson, who was also at the meeting. She then made an appearance at a free tax filing seminar held on our campus through the IRS and the Computer and Communications Industry Association. She wrapped up her visit by joining Chancellor Lisa Brown and saw the demolition work happening in the Pierone warehouse, which is where the University District Health Clinic will sit next spring.